Kaitlin Willoughby (#28) hits top gear for the Huskies. When Kaitlin Willoughby and Kandace Cook get rolling, the University of Saskatchewan Huskies women’s hockey team keeps on winning. There is no doubt the Huskies have vaulted into first overall in the Canada West Conference with an 11-3-2 record and 32 points in the standings thanks to an outstanding team effort. Everyone on the roster of the defending Canada West champs can look at their individual play and realize how important they were doing their part to get the Huskies where they are. Willoughby and Cook add an X-factor dimension that gives the Huskies that much an extra edge in a conference where seven points in the standings is all that separates the teams that sit between first and sixth. Those two forwards are extremely hard for opponents to make game plans for. Coming into the season, Willoughby, who stands 5-foot-6, might be the most well-known player on the Huskies roster. Last season, the young Prince Albert product was the CIS rookie of the year for women’s hockey picking up 10 goals and 15 assists in 28 regular season games. Of course, she netted the double overtime winner to give the Huskies a 2-1 victory in Game 3 of the best-of-three Canada West title series back in March over the Regina Cougars. In her sophomore campaign, she looks like a faster and more powerful skater than she did as a rookie. 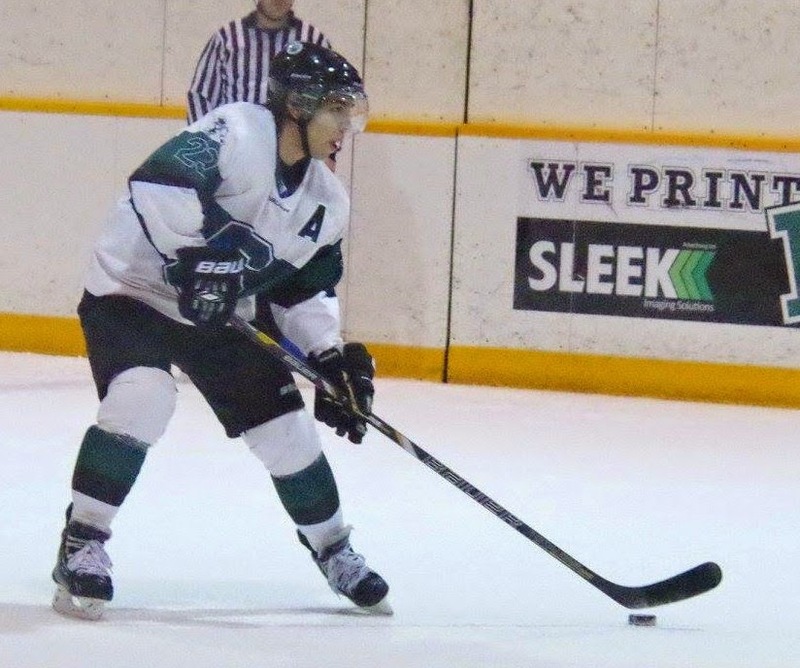 The former star of the Prince Albert Bears midget AAA team came into the season with a different challenge. Thanks to the accolades she captured last season, Willoughby automatically becomes the centre of attention of every opponent the Huskies face. She will see every team’s best defensive pairing and a host of good defensive forwards. Early on, she went through an unthinkable five straight games without recording a point. That changed on Oct. 24, when she netted a goal and two assists in a 4-3 home victory over the Calgary Dinos. Willoughby also has points in the Huskies last four games netting three goals and four assists over that stretch. On the season, she has eight goals and seven assists in 16 games. Blessed with an abundance of skills, Willoughby was a key figure for the Huskies this past weekend at the Rutherford Rink. On Friday, the Huskies trailed the visiting Mount Royal University Cougars 2-0, and Willoughby went to work. She scored twice to even things up at 2-2 and then picked up an assist on the game winner from Kennedy Harris. Hard working defenceman Brooke Mutch picked up the last tally in a 4-2 victory, while Cassidy Hendricks made 15 saves for the win in goal. On Saturday after Carlee Hrenkiw put the Huskies up 1-0, Willoughby collected an assist on a deflection goal by Cook to cement a 2-0 victory. Hendricks made 18 saves to earn the shutout in net. At the moment, it is possible Willoughby is only scratching the surface of how good she might be. If she keeps focused on working hard on her game, she might get the chance to achieve great things in the future. Kandace Cook takes a draw for the Huskies. Cook is a fearless fifth-year veteran that stands only 5-foot-2, but plays like she is 6-feet tall. She provides both a calming influence to the team and sets the tone for games with her unmatched compete level. Pound for pound, she might arguably be the strongest player in the Canada West conference. She is the “Mighty Mouse” of her team. In her team’s sweep of the Dinos in late October, Cook turned heads with the way she was able to physically take Canadian hockey legend Hayley Wickenheiser out of the faceoff circle. Cook also stepped up to be a difference maker during an early season turning point. After a 2-3 start, the Huskies faced the always powerful Alberta Pandas to finish off a weekend series at the Rutherford Rink on Oct. 18. The Lloydminster Steelers graduate scored twice including the winner on the power play to give the Huskies a key 3-2 victory and start a five game winning streak. She has already tied her career high with six goals this season and also has four assists. An assistant captain, Cook provides leadership by setting an example with her strong play on the ice. In the Huskies final game before the Christmas break, head coach Steve Kook had Cook and Willoughby on a line together with Edmonton product Rachel Johnson. That line might have some interesting potential, if it stays together. Even if that unit it split up, Willoughby and Cook will definitely be two players to watch after the Christmas break. Their hard work might result in some more cool championship memories in March. Craig McCallum looks for a chance to score for the Huskies. The Huskies men’s hockey team ended up stumbling into the Christmas break with a pair of heartbreaking losses to the Mount Royal University Cougars in Calgary. On Friday, it turned out the three goals wasn’t enough to power the Huskies to a win. They led 3-1, but the Cougars roared back to tie things up at 3-3 and eventually take the contest 4-3 after a tiebreaking shootout. Matthew Spafford, Craig McCallum and Sean Aschim all picked up singles for the Huskies, while goaltender Ryan Holfeld made 35 stops over 70 minutes and stopped two of three shooters in the shootout. David Stephens, Billy Marshall and Matthew Brown all picked up singles for the Cougars. Brown had the only goal in the tiebreaking shootout. Goaltender Cam Lanigan made 22 stops over 70 minutes and turned away all three shooters he faced in the shootout. On Saturday, the Huskies dropped a tough 2-1 decision to the Cougars. McCallum had the lone goal for the Dogs, while Jordon Cooke made 24 stops taking the loss in goal. Sebastien Pare and Tyler Fiddler had singles for the Cougars, while Lanigan turned away 25 shots to earn the win in goal. The Huskies still sit fourth overall in the Canada West Conference with an 8-9-1 record. Nelson Nogier in action for the Blades. 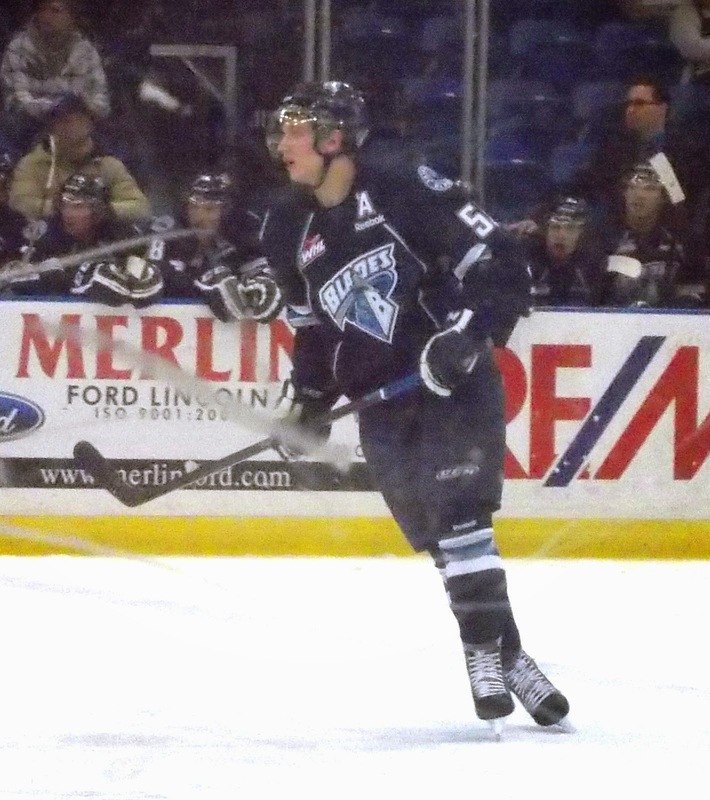 Life in a rebuilding year is definitely not easy for the Saskatoon Blades. Even when it seems they are going to get a big victory, one bad shift washes those hopes away. That was the story Friday, when the Blades dropped a 4-3 decision in overtime to the Brandon Wheat Kings, who are a WHL powerhouse club this season, at the Sasktel Centre. Saskatoon led 3-2 with less than 30 seconds to play, and fresh players were on the ice to fend off a final Brandon rush to preserve victory. The Wheat Kings entered the Blades zone fairly easily and Brandon forward Tim McGauley had the puck below the icing line to left side of the Saskatoon goal. Blades defenceman Adam Henry had a chance to collapse down on McGauley, but the blue-liner froze. McGauley fed a pass to rearguard Ryan Pilon, who pinched down to the slot. Pilon wired home the equalizer with 5.6 seconds to play in the third. Brandon scored just 37 seconds into overtime as McGauley banged home the rebound from a Jayce Hawryluk shot. After dropping a 4-2 decision to the Warriors in Moose Jaw on Saturday, the Blades are 7-18-2 and are sitting 11 points out of a playoff position. The loss in Moose Jaw was made even more difficult, when the Blades had to stop using centre Alex Forsberg at about the 11-minute mark of the second period. Due to a clerical error by a Moose Jaw staffer, Forsberg was not on the gamesheet. He left the game, when the Blades and Warriors were tied 1-1. While the Blades are taking their lumps, the team’s fans have to be credited for being understanding. Friday’s loss was witnessed by 4,548 spectators on a night the weather wasn’t very good and the roads in the city were in rough shape. The Blades will be out-manned in a number of games, but all they can do is ensure their work ethic is good on a nightly basis. They play their next five games on the road against opponents from the B.C. Division. They open the swing Tuesday against the Blazers in Kamloops. The 102nd Grey Cup didn’t turn out to save what was a forgettable CFL season. In 2014, CFL games were dominated by defensive battles, an excessive amount of penalty calls and very few exciting finishes. Traditionally, the league is well known for wide open exciting battles with lots of passing and kick return yards. Sunday’s championship game at B.C. Place in Vancouver saw the Calgary Stampeders prevail over the Hamilton Tiger-Cats 20-16 in a game that has to rate between average and good. The game did have a compelling ending, but not for the reasons the league would like. Up by what would be the final outcome of 20-16, the Stampeders punted the ball away to the Tiger-Cats dangerous returner Brandon Banks. Banks started left, reversed his field to run right and returned the kick about 90 yards for an apparent go-ahead touchdown with 35 seconds to play in the fourth quarter. On the play, Tiger-Cats linebacker Taylor Reed was called for an illegal block on Stampeders linebacker Karl McCartney, which cancelled out the major score. Looking at the video, the call was close. There was an angle that made it look like the block was from the side and another angle where it looked like the block was a bit in the back area. The block also came in the fringe area, where it can be argued that McCartney might not have been able to make a tackle. It was one of those calls where objectively you can say there shouldn’t be a problem if it was made or wasn’t made. There was enough on video to show it was a penalty. If it wasn’t called, it could still stand up as well. It was at the official’s discretion. Unfortunately with the way this season has gone, the end result would likely be hard for most non-Stampeders fans to take, because of how penalties have been called for most of this season. You can be sure league officials will be looking at rules and how penalties have been called in hopes of opening up the game again. With that said, strong defensive play should have its place to be appreciated as well. Attendance at the Grey Cup was also 52,056, which was 1,423 short of a sellout. That figure will be another thing that concerns league officials, because you shouldn’t have to bank on the Saskatchewan Roughriders making the Grey Cup to guarantee a sellout due to their fan base. The off-season in the CFL will be interesting. Time will tell if what happened in the 2014 campaign was a blip on the radar. If you have any feedback on this blog, feel free to email comments to stankssports@gmail.com. Captain Brandy West-McMaster and the Regina Cougars in 2000. At one time the notion that everyone would be competitive and good in the Canada West women’s hockey conference was a dream. That dream is definitely a reality, and that reality goes for the entire Canadian Interuniversity Sport women’s league. I am one of the few people that witnessed in person the night the two Saskatchewan based CIS squads won, for the moment, their lone respective Canada West titles. 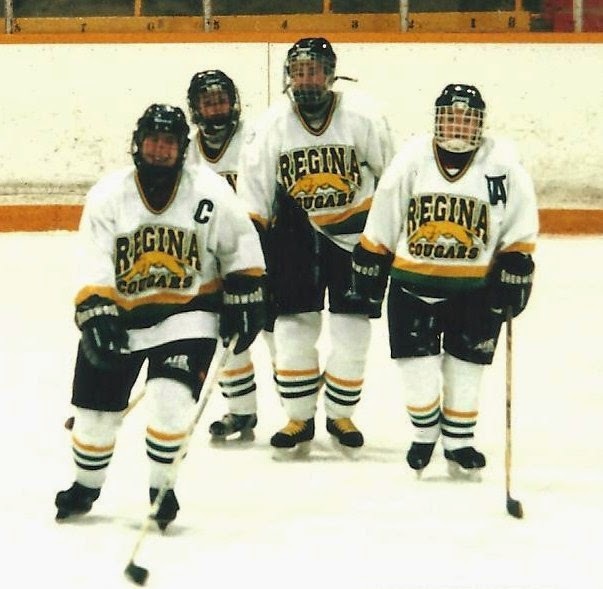 Captain Brandy West-McMaster and the University of Regina Cougars claimed the Canada West title in 2001 and won silver at nationals. 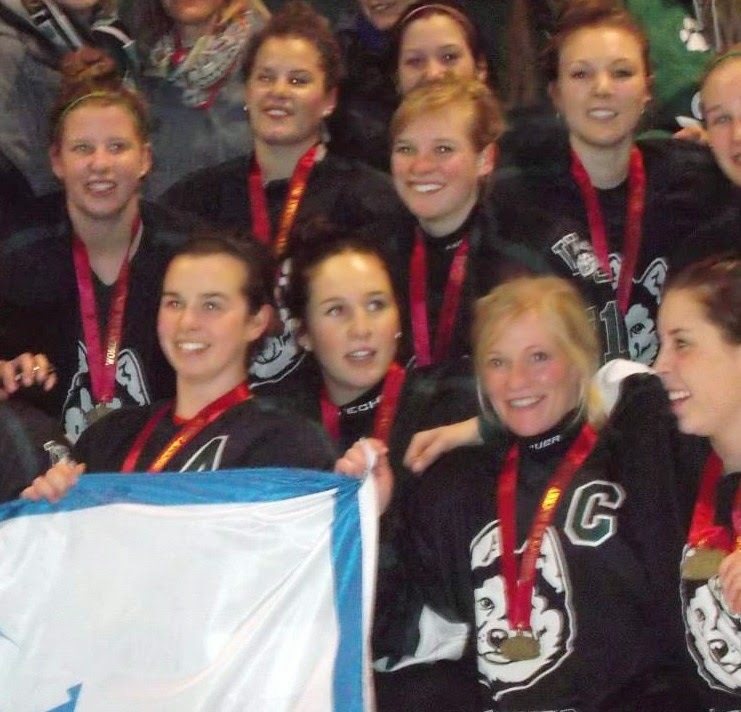 Captain Cami Wooster and the University of Saskatchewan Huskies won the Canada West title last March and captured a bronze medal at nationals. Between those respective conference title victories, I barely got to see any CIS women’s games. I have witnessed a steady diet of games this season featuring the Huskies, and I saw a large number of games in the 2000-01 campaign featuring the Cougars. The overall quality of the league now is light years of what it was then. When the Cougars won their conference title, that season marked only the fifth time a CIS title was contested in women’s hockey. Over a period of 13 years, a huge minor system has sprung up for girls’ hockey in Canada. The minor system feeds a large number of midget AAA girls’ teams that compete in highly competitive leagues, which have a strong history of regular season play dating back for about a good decade. That system has produced a steady stream of skilled players for Canada West and the CIS. Those players have all received top rate coaching growing up, and it shows on the ice. 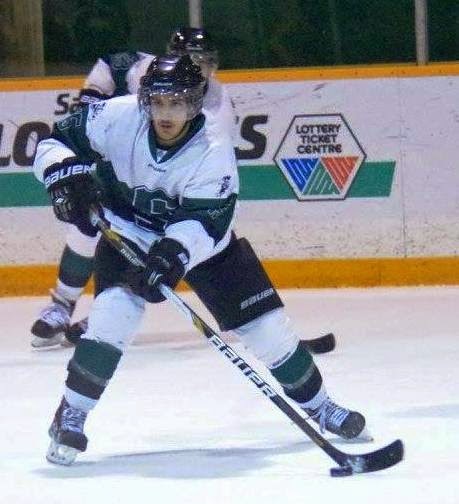 Captain Cami Wooster and the Saskatchewan Huskies in March. The Huskies won their Canada West title in a conference that was vastly superior to what Canada West was when the Cougars claimed their title. 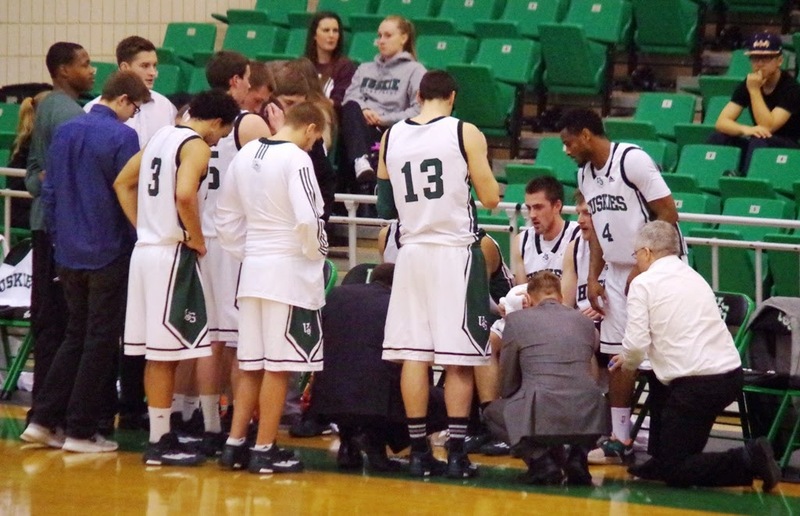 In the current Canada West season, six teams are in a tight race for first overall. Lethbridge and Mount Royal are sitting on the outside of the playoff picture, but both those teams are good enough to manufacture upsets over the other six teams in the conference. Lethbridge and Mount Royal don’t really look out of place, when they face the teams currently holding playoff spots. Everyone’s understanding and execution of systems play is tremendous. The mental toughness the players display and their ability to bounce back when things go bad is also outstanding. Back when the Cougars won their conference title, the majority of their players grew up playing hockey in boys’ leagues. The star players almost always had a strong background in boys’ hockey. Girls’ only leagues in minor hockey weren’t that established, and it showed at the Canada West and CIS levels. There were a number of players on CIS teams that switched over from playing ringette. Others didn’t have that many years playing the sport of hockey and flat out had trouble skating. During those days, the Cougars and University of Alberta Pandas attracted the best players, and it showed on the scoreboard. In their second last regular season game of the 2000-01 campaign, the Cougars set a then team record for goals in a game blasting the Calgary Dinos 16-1. The Dinos, who had 10 first-year players, were typical of a number of the Canada West teams back then. 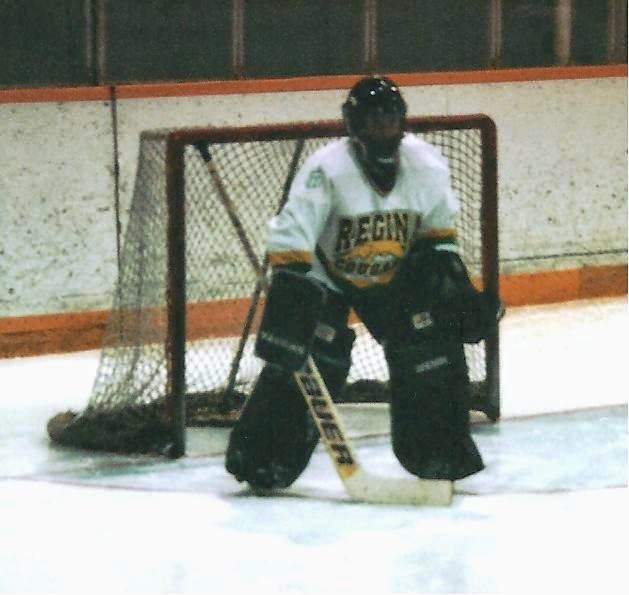 Laura Paradis in goal for the Regina Cougars in 2001. They just didn’t have the players to compete with the Cougars and Pandas, which resulted in a two-tiered conference. As a result, there were a number of lopsided games, where the players on the losing side were crushed on a number of levels. The Cougars swept the Pandas in a best-of-three Canada West final series in 2001 posting a 2-1 overtime victory in Game 1 and a 3-1 triumph in Game 2 at dungy Exhibition Stadium. Game 2 marked the last time the Pandas would lose a game in four years. They proceeded to run off a 110-game undefeated streak that included 109 victories, one draw and three CIS championships. The Pandas roster featured former Canadian Olympic team player Judy Diduck for most of that run. For a short time, the Pandas created a third tier being above everyone else. In the 2013-14 campaign, the Huskies had to be on top of their game almost every night to put together and 18-4-6 regular season record. They met the Regina Cougars in a best-of-three Canada West final that seemed destined to never end. The series went the distance with every game going to overtime. A total of 17 periods and 296 minute of hockey were played. It finally ended when Kaitlin Willoughby netted the series winner to give the Huskies a 2-1 victory in double overtime in Game 3 at the ancient Rutherford Rink. It is fair to say the Canada West champion Cougars of 2001 would have had a really difficult time beating the Huskies Canada West championship team of 2014 or the Cougars team the eventually fell to the Dogs in that marathon conference title series. If you were able to send Huskies standouts like Wooster, who was as extremely special and dynamic player, Willoughby, Sara Greschner, Kandace Cook, Julia Flinton and goaltender Cassidy Hendricks back in time to play in Canada West in 2001, they would have put up insane numbers. Their athletic level is just way better than the players of that time. Cassidy Hendricks in goal for the Saskatchewan Huskies. With that said, the 2000-01 campaign was a different time. West-McMaster put up Wayne Gretzky type offensive numbers in that era of the CIS. 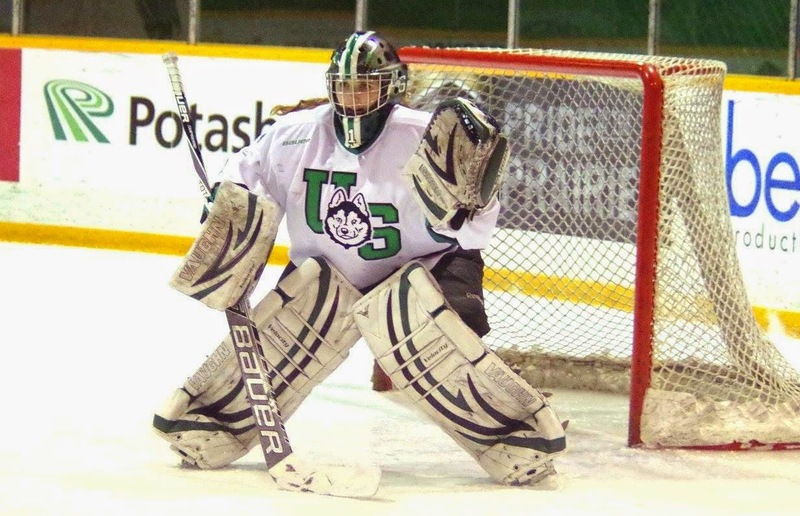 The Cougars other standouts like Erin Tady, Erin Balfour, Julie Foster, Joell Fiddler, Tanya Hutcheon and goaltender Laura Paradis worked extremely hard at their games and were the class of that time. The Cougars players also showed a lot of heart coming up through minor hockey. West-McMaster and Paradis both had really good experiences growing up and playing in boys’ leagues. A number of other players had experiences of being run through the boards. Hitting at all levels then in the boys’ ranks was more liberal that it is today. Any ponytails that were seen sticking out of the back of helmets saw the girls get viewed as targets. In various instances, the boys would try to hit the girls hard enough to make them quit. A few girls shed tears in the arms of their parents and even admitted they wanted to walk away from the game. The fact those players didn’t walk away was amazing. As a unit, the Cougars 2001 Canada West championship team showed the potential of what the conference and the CIS league could become. As a group, the Huskies 2014 Canada West championship team and their modern day conference and CIS rivals have far exceeded what that potential would look like. When you connect everything together, it is an inspiring story to see. Lauren Zary wheels with the puck for the Huskies. Wow! 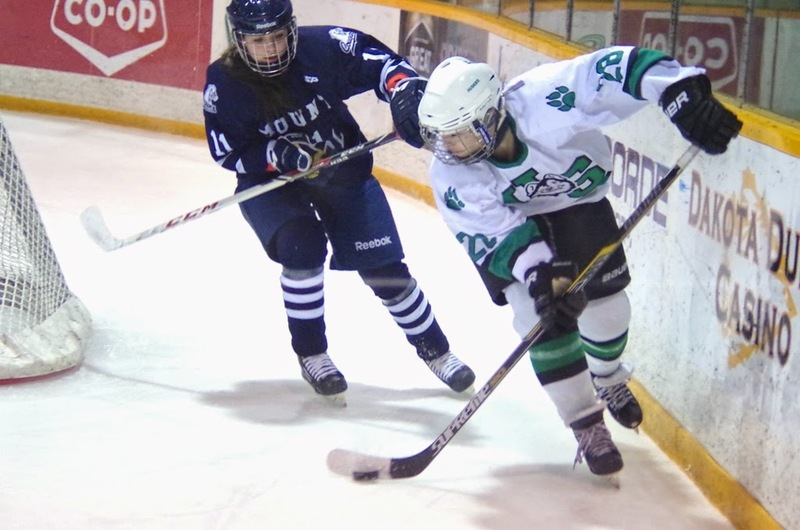 Two regulation wins later and the University of Saskatchewan Huskies jump from a tie for fifth into a tie for first in the Canada West women’s hockey standings. Last weekend, the Huskies swept away the University of Lethbridge Pronghorns by scores of 3-0 and 2-0 on Friday and Saturday night respectively at the ancient Rutherford Rink. The victories allowed the Huskies to improve to 9-3-2 and vault into a four-way tie for first in the conference with 26 points at the halfway point of the regular season. The four-way tie was caused because the women’s Canada West conference is using a news system for tallying points in the standings this season, which is similar to one used in the Olympics. Regulation time wins are worth three points, extra time wins two points and one point is awarded for an extra time loss. 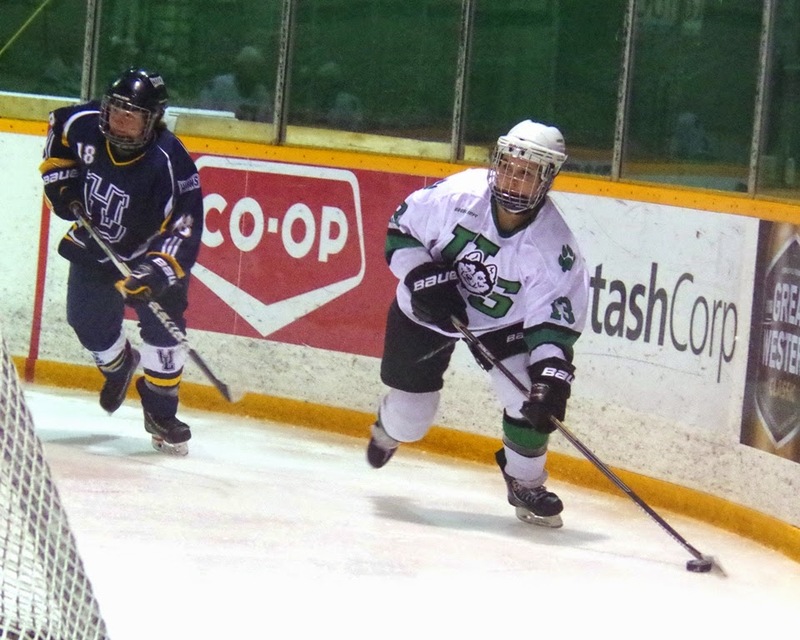 The same system is being utilized in the Saskatchewan Female Midget AAA Hockey League. The Huskies recorded their 26 points thanks to six regulation wins. The other three teams with 26 points include the Alberta Pandas (9-5) with eight regulation wins, the Manitoba Bisons (9-4-1) with seven regulation wins, and the UBC Thunderbirds (8-3-3) also with seven regulation wins. The Calgary Dinos are a point back of that foursome with a 7-3-4 record. All of their wins have come in regulation. The Regina Cougars sit holding the final playoff berth in the conference at 9-4-1, but they only have 22 points in the standings due to only winning three times in regulation. If the standings were still tallied the old way where a win in any form was worth two points, the Huskies would have been alone in first with 20 points. The Bisons, Thunderbirds and Cougars would have all been tied for second with 19 points. The final two playoff berths would be held by the Pandas and Dinos tied with 18 points. So what does one make of the logjam? The rule for putting in three points for a regulation win was put in to reward a squad for earning victory in the regular three periods of play. The idea of this rule has been bantered around at the NHL level. In theory, it was expected earning three points for a regulation win would create more separation in the standings. In the Canada West women’s standings where there isn’t that much difference between the teams, the standings are still tight even with three points being awarded for a regulation win. The Regina Cougars could argue they are the biggest loser under the new system. To be fair, they found the heart to get six wins done in extra time, but are given no reward for having that heart. That is the downfall of a system that awards three points for a regulation win as opposed to giving two points for any type of win. For me, the jury is still out on which system is better. The final judgment will likely be made during the Canada West league meetings in the off-season. As for the Huskies at this point in time of the season, there are always things to improve on, but they have to be really happy with where they sit. They have been very consistent in executing game plans, overcoming points of adversity and taking each step of the way very professionally. They are not visibly too high after wins or too low after setbacks, and that is a very impressive thing to see. In the sweep of the Pronghorns, the Huskies big players came through. Goaltender Cassidy Hendricks made 34 save over the two matches to up her shutout total to three on the season. Marley Ervine, Kaitlin Willoughby and Julia Flinton had singles on the first night. Rachel Johnson scored twice on the second night. They conclude play before heading into the Christmas break and final exam period this coming Friday and Saturday hosting Mount Royal University Cougars (2-9-3) at 7 p.m. each night at the Rutherford Rink. Michael Sofillas in action for the Huskies. The Huskies men’s hockey team extended their winning streak to three games earning a pair of wins on the road against the Pronghorns. On Friday, the Huskies exploded for a 3-0 lead and held on for a 3-2 win. Michael Sofillas, who is starting to find an offensive touch, scored twice, while Sean Aschim had a single. Ryan Holfeld made 31 saves for the win. On Saturday, the Huskies posted a much more convincing 5-1 victory. Josh Roach scored twice, while Matthew Spafford, Sofillas and Parker Thomas all had singles. Jordon Cooke made 29 saves to pick up the win. The Huskies (8-8) have been up and down in the goal scoring department this season, so they will be looking to keep the offensive numbers up during their final two games before the Christmas break. They travel to Calgary this coming Friday and Saturday to take on the Mount Royal University Cougars (10-6). Those two clubs split their two meetings earlier this month at the Rutherford Rink. The Huskies men's basketball team huddles around their bench. Dadrian Collins was sinking threes like he was a secret character on that 1990s legendary video game NBA Jam on Saturday. The fifth-year forward went off for the Huskies men’s basketball team from beyond the arch going 8-for-8 from downtown on Saturday at the Physical Activity Complex on the U of Saskatchewan campus. He hit seven of his threes in the game’s first half. Overall, he finished the contest with 28 points helping the Huskies cruise to a 95-70 victory over the University of Victoria Vikes. One night earlier, the Huskies downed the Vikes 82-70, and fourth-year guard Michael Scott led the way for the Dogs with 19 points. The Huskies sit at 4-2 in regular season play. The Huskies women’s team earned a sweep over the Vikes winning 71-62 on Friday and 89-68 on Saturday. Star post Dalyce Emmerson led the way leading the Huskies with 17 and 20 points on respective nights. 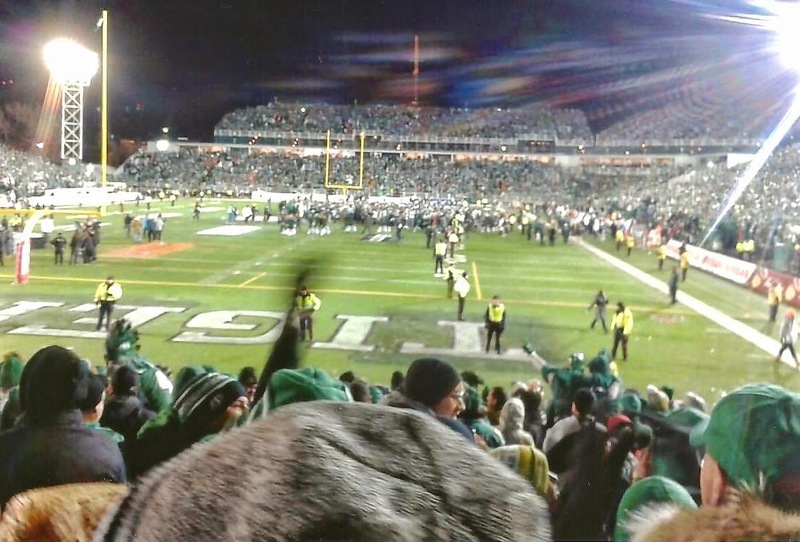 Mosaic Stadium at the close of the 101st Grey Cup. Most people in Saskatchewan will be able to remember where they were a year ago today. The Saskatchewan Roughriders blasted the Hamilton Tiger-Cats 45-23 in the 101st Grey Cup at Mosaic Stadium, which I still refer to commonly as Taylor Field. It was the last Grey Cup to be played as Mosaic, as a new stadium is currently being built in Regina. The contest also marked the first time the Roughriders were in the Grey Cup final at home and the only time they would win the legendary trophy on the field they have called home since 1910. I was at the game in person and being there in person was beyond anything you could have imagined for the bucket list. I have been at Taylor Field in many difference capacities for many football games at various levels, and the 101st Grey Cup was definitely the most memorable. I also remember partying until like 5:30 a.m. out in the streets and in various locations in Regina. I think it took like two days to sleep that all off. The night had a euphoric experience from a fan perspective I had never seen before or since. I could not imagine what the feeling was like for the players, and I had a few buds on the team. As for players, I was most happy for quarterback Darian Durant, who put so many years of hard work in with the team and finally won the big one as the starter. In my handful of dealings with him, it is very evident he cares a lot about the Roughriders franchise, and I still don’t think the team’s fan base fully appreciates that fact. I was also really happy for my old Regina Rams bud Neal Hughes, who won his second Grey Cup ring. He took the victory with the joy of a little kid playing minor football on Regina’s Leibel Field. In my heart, I hope that wasn’t the last Grey Cup win he tasted as a player. The 34-year-old fullback was limited to playing just two games because of a nagging foot injury this past season. After 11 seasons in the league, there is no certainty his playing days will continue. With that said, it is great for today to look back and remember how great the day was. Darren Steinke is a former sportswriter with the Medicine Hat News, Prince Albert Daily Herald, and the Carillon, which is the student newspaper at the University of Regina. He also had a short stint as a general news reporter for the Saskatoon StarPhoenix. Steinke is best known for covering the WHL for 20 seasons, which included a decade following the Medicine Hat Tigers. In Regina, he is best remember for ties to the University of Regina athletics program. In the summer of 2014, he decided to move to Saskatoon to be closer to family. Opinions on this blog are his own. He plans to write ongoing entries regarding his thoughts on sports. Entries will also include ongoing experiences away from sports, because there is so much more to enjoy in life. If you like the content on the Stanks' Sermon blog, feel free to donate to the cause by clicking on the Paypal button in the top right corner of the blog. Steinke is also a freelancer writer and photographer for hire and can be contacted at stankssports@gmail.com. Follow him on Twitter for various interesting, head scratching and sometimes humourous posts @StanksSports. Hellboy Fails To Raise Any Hell!